Starbucks CEO Kevin Johnson announced Tuesday that the company is about to turn in its worst quarterly year-over year same-store sales performance in nine years. While that is being seen as a one-time hit by many as a result of the company's half-day racial bias training store closures, the bigger long-term news is that the world's number 3 fast-food outlet (in number of locations) is closing 150 U.S. stores, three times the normal annual number. It's not difficult to read Johnson's comments as indicating that the shuttered stores will primarily be in "blue" or liberal sections of the U.S. At the same time, he has specifically targeted "middle America and the South," i.e., more conservative "red" areas, for expansion. The business press isn't even trying to make the obvious connection between Johnson's announcement and the respective presence or absence of high minimum-wage laws and excessive regulation. Meanwhile, the Associated Press's brief related dispatch didn't even mention the strategies Johnson identified. It instead focused on the "uproar over the arrest of two black men at a Philadelphia Starbucks" and the "racial-bias" training which followed in late May (which may indeed have had an effect on the current quarter's performance). It's not plausible that a company with decades of experience at successfully locating stores has suddenly made 100-150 cannibalization mistakes. 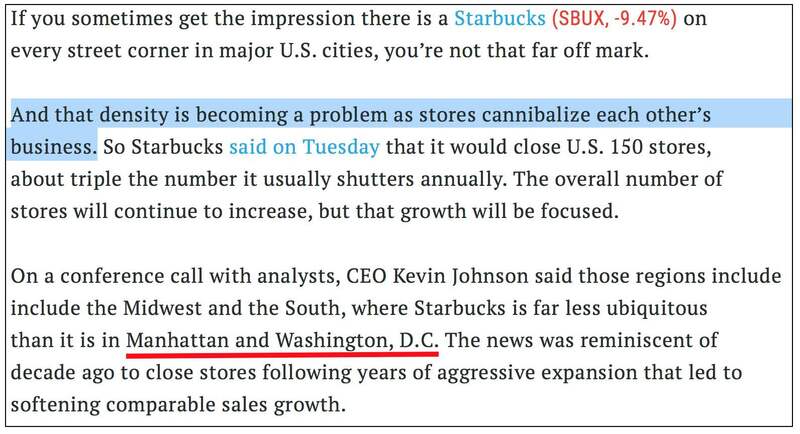 What's really happening instead is that roughly 100 formerly profitable stores (the 150 closing this year less 50 which have typically closed because of other factors in previous years) have become unprofitable and not worth saving for reasons other than "ubiquitous" locations. Looking at the areas Fortune.com mentioned, Manhattan's regulatory over-reach is legendary, while the mandated minimum wage for New York City, currently at $13 per hour, up from $11 last year, will be $15 next year. No business can absorb a 36 percent spike in its labor costs, which usually work their way into other employees' pay scales, without negative consequences. In DC, the current minimum of $12.50 per hour will move to $13.25 on July 1, and to $15 two years later. A key question in the next few years is whether the improved economy will be sufficiently robust to create market-wage pressures which enable areas like New York City and DC — and of course Seattle, Starbucks' home, where $15 is already the law — to effectively get away with moves that would ordinarily reduce the number of available jobs and increase unemployment. In his early-May ADP Employment Report conference call, Moody's economist Mark Zandi, the report's director, said he believed that this is indeed what will happen, and that negative employment effects will be "relatively small." Starbucks' store-closure announcement casts significant doubt on Zandi's assessment. That should be news.